Matthew Kind of CannaInsider interviewed LeafLink CEO Ryan Smith, a member of the “Forbes 30 under 30” list who entered the cannabis industry in 2015 from a real estate background after selling his software company Trupoly to public company RCS Capital in 2014 (which declared bankruptcy after Smith left). LeafLink is a wholesale B2B management platform with 1200 retailers and 200 brands across five states. The company, which provides an online marketplace for retailers to communicate and purchase inventory and order management systems for the brands, launched initially in Colorado and then entered Washington and is now in California, Nevada and Oregon as well. Smith described the early days of the company, where he and his co-founder Zach Silverman, who serves as CTO, met with brands, cultivators and retailers and found that the industry was quite inefficient. The typical dispensary was purchasing from 20 to 50 brands per week and using text messages and faxes to manage the process. 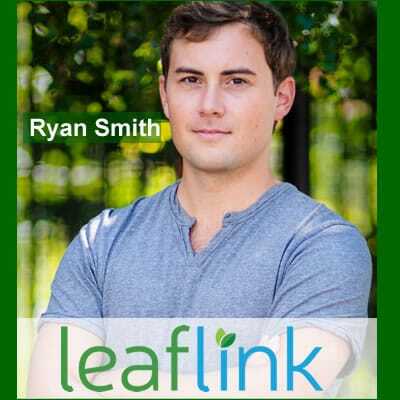 Leaflink built a system to streamline the process for ordering primarily branded products, which Smith thinks will ultimately dominate the economic value of the industry. He breaks his brand clients into three different components, including the industry leaders, which today have more than 50% share and are looking to expand geographically, a second-tier of established but not leading brands and then a third category of new brands. Smith claims to have 80% penetration into Colorado and 70% in Washington. Leaflink is free to retailers but collects a monthly charge from brands. In late 2015, the company raised an initial $1mm, and then it raised an additional $3mm earlier this year, with funds raised from several institutions, including Lerer Hippeau Ventures and Casa Verde Capital. Smith suggests that the company will remain focused on its core mission of being a marketplace, a communication tool and a community for buyers and sellers and expects the growth will come from additional geographic expansion.